The Colombian Military Army is divided into 7 Divisions, each with a flag and a Coat of Arms. Each Army Division flag is based on the Colombian Army Flag Without Arms, but with the Division's Coat of Arms on the middle. 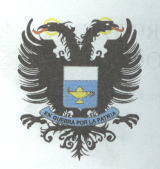 Coat of Arms are at <www.ejercito.mil.co>. 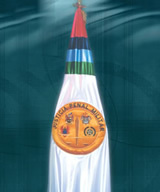 Pennants are based on <www.mindefensa.gov.co>. The pennants are flown on Colombian Independence Day (July 20), and also whenever there are Military Parades. The pennants are not displayed as car flags. They are used usually by a designated Officer or NCO, mostly for mertiorious deeds (usually the highest decorated soldier of a given military unit). The pennant is at the top of a small pole, and the standard bearer goes in front of the unit that his pennant represents. Not only the Army Divisions have Pennants, but also other units. The pennants are part of the military unit. The honor for the bearer is the opportunity to lead his unit carrying the pennant. Thus, the pennant IS NOT an award like the US CommendationRibbons. There is also an additional flag for each one of the Seven Army Divisions that Colombia currently has. This is the Colombian official flag plus the name of the Division below. So that means that all seven should have the same pattern. This is a general rule for all Colombian Military flags. Source: Capture from Colombian TV news channel RCN. Official website of Primera División (First Division) at <www.primeradivision.mil.co>. Official website of Segunda División (Second Division) at <www.segundadivision.mil.co>. Official website of Tercera División (Third Division) at <www.terceradivision.mil.co>. Official website of Cuarta División (Fourth Division) at <www.cuartadivision.mil.co>. Official website of Quinta División (Fifth Division) at <www.quintadivision.mil.co>. Official website of Sexta División (Sixth Division) at <www.sextadivision.mil.co>. Official website of Séptima División (Seventh Division- HQ in Medellin, Department of Antioquia) at <www.septimadivision.mil.co>. All the additional official flags have the same plain beckground. This is the flag of the Military Communications branch based on photo taken from El Espectador on July 20, 2005 during a military parade to commemorate Colombia's Independence Day and coat of arms from the book "Himnos y Símbolos de Nuestra Colombia", by Julio César García, Camer Editing (2000). See also official site at <www.jedoc.mil.co>. On an bright orange field, a shield chequy black and seafoam-green, with a smaller shield in its center, parted per bend sinister or, charged with gules bezant, and argent, charged with azure bezant. Crest is the Earth with an arm holding three red lightning bolts jutting out of the North pole. Red ribbon below with motto "CIENCIA, DOMINIO, VIGILANCIA.". The flag of the Decimotercera Brigada (Thirteenth Brigade) based on patch of this Army Brigade at Colombian Army's official website and photo of flag seen during a parade at the Brigade's HQ in Bogotá at CAMBIO magazine. The MFO is an indpendent "task force", created after the Camp David Accords (1978). It is an independent international organization (non-UN peacekeeping force) and it is made up of different countries. The Multinational Force & Observers is responsible for supervising implementation of the security provisions of the Treaty of Peace between Egypt and Israel. The "Batallón de Infantería Colombia" No. 3 (Infantry Battalion No. 3 "Colombia"), abbreviated BICOL, is attached to the MFO. Official website at <bicol3.galeon.com>. Here is a photo of the pennant of Infantry Battalion No. 3 "Colombia". The AFEAU (Agrupación de Fuerzas Especiales Antiterroristas Urbanas, Urban Special Antiterrorist Forces Group) are an elite force depending directly from the Comando General de las Fuerzas Militares (General Command of Military Forces). The Additional official flag should be the official flag of Colombia with the same ratio with Coat of Arms, but the inscription on the upper red fringe of the Coat of Arms reads "REPUBLICA DE COLOMBIA" and the bottom inscription hould read AFEAU. The image is based on photo from Colombia's Independence Day, July 20th, 2002. taken from the Ministry of National Defense official website. The Pennant is based on photo taken from TV channel Canal A. The photo is from Colombia's Independence Day, July 20th, 2003. Homepages of AFEAU at <www.ejercito.mil.co> and <www.cgfm.mil.co>. The difference between the Brigada de Fuerzas Especiales (Special Forces Brigade) and the AFEAU (Urban Special Antiterrorist Forces Group), is that the Brigade is made up of Battallions that operate temporarily attached to any given Army Battalion or Army Brigade, with national jurisdiction, while the AFEAU units are platoon-sized elements that are permanently based on the Headquarters of each Army Division, so they only have operational jurisdiction over the area in which their Division operates. Now, there are five AFEAU groups even though there are seven Army Divisions in existence: the Colombian government is getting the funds and its men trained in order to create two more AFEAU groups. All Colombian Military Units have an official flag and also an official pennant (usually having the initials of the unit). This is the Pennant of this military unit called Brigada de Fuerzas Especiales, or Special Forces Brigade. It's abbreviation is BRFER. It is directly below the General Command of Military Forces in the structure on the military organization. The difference between the Brigada de Fuerzas Especiales (Special Forces Brigade) and the AFEAU (Urban Special Antiterrorist Forces Group), is that the Brigade is made up of Battallions that operate temporarily attached to any given Army Battalion or Army Brigade, with national jurisdiction, while the AFEAU units are platoon-sized elements that are permanently based on the Headquarters of each Army Division, so they only have operational jurisdiction over the area in which their Division operates. Now, there are five AFEAU groups even though there are seven Army Divisions in existence: the Colombian government is getting the funds and its men trained in order to create two more AFEAU groups. 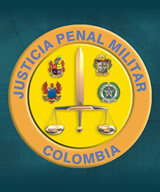 "The flag of the Criminal Military Justice (Justicia Penal Militar) has a white background and four stripes, from top to bottom red, dark blue, light blue and green. On the center a circled Coat of Arms, on dark yellow background, bearing a sword with the tip facing upwards, superimpossed on the balance of justice, both with golden ends, with the Coats of Arms of the Army, Navy, Air Force and National Police [hence the colors mentioned before], and with the motto around reading 'CRIMINAL MILITARY JUSTICE' written in black letters. "White represents transparency, trust, honesty; the colors red, dark blue, light blue and green, as well as their corresponding Coats of Arms, represent each one of the Forces in which the Criminal Military Justice serves which are: National Army, Navy, Air Force, an National Police; the yellow and gold colors stand for commitment and wisdom. The balance featured on the flag is the universal symbol of justice". 2. Batallón de Helicópteros (Helicopters Battalion), rotary wing aircraft. Note the blue background plus the Battalion's Coat of Arms. The Batallón de Helicópteros (Helicopters Battalion) flag is based on a photo. This Battalion is part of the Brigada de Aviación (Aviation Brigade), a newly created Colombian Army Branch. This is the flag of the Escuela de Lanceros (or Lancers School), in which the military and police personnel of the Colombian forces take courses to become an elite force of highly trained mobile force to combat the guerilla and the paramilitaries. It is based on the US Army Ranger system, and lots of foreign applicants go there as well. The flag is the Colombian flag, plus the Coat of Arms and on the bottom it reads ESCUELA DE LANCEROS. These units as elite units, initially within the Cavalry Branch of the Colombian Army, but currently it is another specialty course taken by any Army member who passes the tests and is eligible to take the course. I recall that when this Lancers School was established back in the mid 1950's during the military regime of General Gustavo Rojas Pinilla (who took power on a coup d'etat and actually ran a series of military reforms), the model of the Lancers School was taken form the U.S. Rangers. Source: Picture taken at the Indepenedence Day parade held in Bogota on July 20, 2004 ( from the Ministry of National Defense at <www.mindefensa.gov.co>). Flag of the Escuela Militar de Cadetes "General José María Córdova" (Military Cadet School Jose Maria Cordova). It is often abbreviated as ESMIC (EScuela MIlitar de Cadetes). This school is for all Army Cadet students who want to be officers. Description of the flag: Horizontally divided flag, with upper side divided into two equal stripes (bootom left green, top right, red). On the obverse the Coat of Arms is located on the green part of the flag. Sources: Coat of Arms at "Himnos y Símbolos de Nuestra Colombia", by Julio César García, Camer Editing 2000. ISBN 958-33-1489-7 page 175, photos from official site <www.esmic.edu.co>. There is another official flag of this Military Cadet School. All military flags have the same legislation (the flag of Colombia plus the lettering of the Unit, and also another official flag with its on Coat of Arms and the proper color background). Source: photo taken at Colombia's Independence Day in Madrid, 2005. There is also pennant of this Military Cadet School. Notice that it reads JMC, the initials of the name of the School (José María Córdova). Source: photo taken at Colombia's Independence Day Parade in Bogotá, July 20, 2003. The official name is Escuela Militar de Cadetes José María Córdova (and not Córdoba). The difference is the "v" goes instead of "b". The explanation for this is pretty simple: back in the 1800's the last name of the youngest Army General in the Colombian Army (José María Córdova), the spelling was with "v". However the Department of Córdoba is spelled with "b". So, for all military purposes, the name of this General is spelled with "v" (The top Army Order is called José María Córdova) and for all civilian purposes it's spelled Córdoba (for example the Police Command for the Department is called Córdoba). This Military Cadet School is a University level institution. This transition towards full academic approval by the Colombian Education authorities was done very recently. Coat of Arms and flag of the Escuela Militar de Suboficiales Sargento Inocencio Chincá (NCO's Military School Sargeant Inocencio Chinca). The official abbreviation is EMSUB. Official website at <www.escuelamilitarsuboficiales.mil.co>. This is the flag of the Escurela de Armas y Servicios (E.A.S.) - School of Arms and Services. It is the equivalent to the ordnance branch of the Colombian Army. Image based on coat of armstaken from the book "Himnos y Símbolos de Nuestra Colombia", by Julio César García, Camer Editing, 2000 and photo from <www.jedoc.mil.co>. I located Colombian Military Intelligence Service flag at <www.esici.edu.co>. Here is the emblem as appear at "Himnos y Símbolos de Nuestra Colombia", by Julio César García. Camer Editores. 2000. ISBN 958-33-1489-7. (image from page 196). 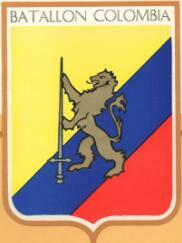 The Military Intelligence is a Branch of the Colombian Army. Is there a reason it uses the insignia of United States Army Intelligence? I do not know if this is the same insignia as the United States Army Intelligence. If that's true then it could possibly be because there were guidelines coming from the U.S. military in either establishing or reestructuring the Intelligence Service. The correct name should be "Escuela de Inteligencia y Contrainteligencia Brigadier General Ricardo Charry Solano" (Brigadier General Ricardo Charry Solano Intelligence and Counterintelligence School).